Top row: Miscanthus 'Illinois' before and after the 2013-2014 winter in Urbana. Bottom row: Miscanthus 'Nagara' before and after the same winter. Urbana, IL (January 30, 2019) - For farmers, Miscanthusrepresents a big up-front investment. The large perennial grass must be established from vegetative pieces at great cost to farmers, but it promises a decade or more of massive biomass yields, starting in year two or three. If a cold winter happens to strike in the first year, however, all bets are off. The cold-sensitivity of the crop has limited its adoption in northern climes, but new research from the University of Illinois shows a way forward for would-be Miscanthus growers in cold regions. The majority of Miscanthus currently being grown for biomass is a single, cold-sensitive genotype, known commercially as ‘Illinois’ for the location of its introduction to the United States. For years, Sacks and other plant breeders around the world have been making crosses and exploring the native region of Miscanthus, trying to find and develop novel cultivars with more desirable agronomic traits. In one of the new studies, Sacks and his colleagues planted 13 of these cultivars the May before an unusually cold winter in Urbana, Illinois. Most of the same cultivars were also planted further south in Dixon Springs, Illinois, and in Jonesboro, Arkansas. In the spring of 2014, it was clear that first-year ‘Illinois’ plants had been decimated in Urbana, though there was little obvious damage to any of the plants in Dixon Springs or Jonesboro. In fact, most of the first-year cultivars were hit hard in Urbana that winter. However, one hybrid stood out. Hongxu Dong, lead author on the studies and former doctoral student in Sacks’ research group, adds that experimental hybrid ‘10UI-032.004’ and one of its parents, M. sacchariflorus ‘Bluemel,’ were comparable to ‘Nagara’ in terms of first-winter survival in Urbana. “This is remarkable considering that the other parent, M. sinensis ssp. condensatus‘Cabaret’, was the least hardy entry in this study,” he says. The researchers also noted that mature plants in other trials in Urbana had much less winter damage and recovered fully by late spring. That observation told them that first-year Miscanthus plants are much more susceptible to damage from cold winters than mature, established plants. The researchers continued to monitor the plants, including their survival rate and biomass yield until the spring of 2015. 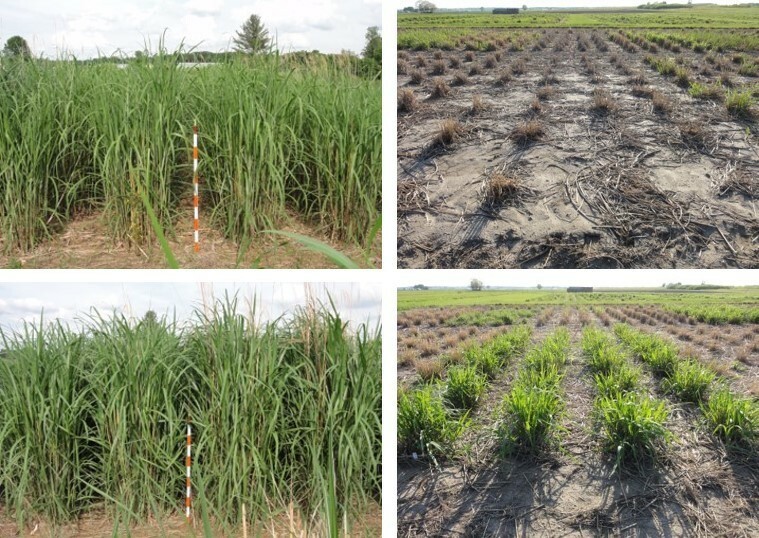 In the second study, the researchers evaluated the effect of Urbana’s 2013-2014 winter on mature Miscanthus plants. The three-year-old plants were crosses between an ornamental Miscanthus variety originally collected in mild coastal regions of southern Japan – Miscanthus sinensis ssp. condensatus ‘Cosmopolitan’ – and one of three others collected in far-flung regions across Asia, from southern Japan to remote areas on the border between China and eastern Russia. Even though the plants were already mature, many of them were badly damaged or dead by spring of 2014, except the cross between ‘Cosmopolitan’ and the Russian variety, Miscanthus sacchariflorus ‘Robustus.’ Like ‘Nagara,’ these crosses didn’t seem to notice there was a winter at all. They all survived and were highly vigorous in the following growing season. The researchers created genetic maps for the plants and were able to identify a number of candidate genes correlated with winter-hardiness. They are now working with those genes to create hybrids that represent the best of both worlds. “Genetic mapping to identify candidate genes associated with valuable traits is a critical step to enable marker-assisted selection, which can be especially valuable for breeding perennial crops like Miscanthus that have multi-year selection cycles,” Dong says. Both papers, “Winter hardiness of Miscanthus (I): Overwintering ability and yield of new Miscanthus × giganteus genotypes in Illinois and Arkansas” [DOI: 10.1111/gcbb.12588] and “Winter hardiness of Miscanthus (II): Genetic mapping for overwintering ability and adaptation traits in three interconnected Miscanthus populations” [DOI: 10.1111/gcbb.12587] are published in Global Change Biology Bioenergy. The research was supported by the Energy Biosciences Institute, the USDA’s National Institute of Food and Agriculture, and the US Department of Energy.